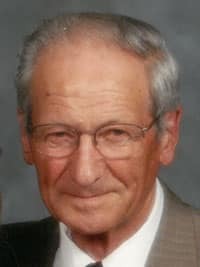 Arthur (Art) Klute - Edmonton's Burial & Cremation Professionals | Trinity Funeral Home Ltd.
On February 10, 2019, Art passed away at the age of 93. Left to cherish Art’s memory are his loving wife of 66 years, Evelyn; his children, his grandchildren, his great-grandchildren, the fur-legged grand-kids, extended family and friends. After working 40 years as a conductor at CN Rail, Art and Evelyn enjoyed over 30 years of retired life together. Hard working and always on the go, we were so lucky to have had him with us for so many years. At Art’s request, no service will be held. Sorry for ur loss. My thoughts and prayers are with u.